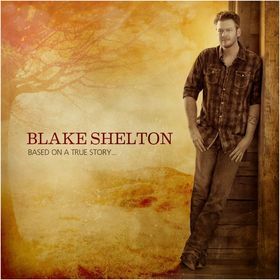 NASHVILLE, TN--(Marketwire - Feb 11, 2013) - GRAMMY winner Blake Shelton announced this morning on the Today Show the release of his new album, Based On A True Story…, March 26, 2013, on Warner Bros. Records. Blake will also perform on The Today Show March 26. This highly anticipated new album features his current smash hit, "Sure Be Cool If You Did," which hit No. 1 on Billboard's Country Digital Tracks chart in its first week of release. "Sure Be Cool If You Did" is creating a buzz, with Entertainment Weekly calling it "ludicrously catchy" with an A- rating and Newsday saying it shows "exactly how 'The Voice' coach-judge manages to maintain his country cred while wading into the mainstream." Blake will be heading out on a major headlining tour of the U.S. beginning July 19th in Virginia Beach, VA. The "Ten Times Crazier Tour" which features special guest Mercury Recording artist, Easton Corbin, and ACM New Female Vocalist of the Year nominee, Jana Kramer, will crisscross the country with dates through the summer. For "Ten Times Crazier" dates, visit: www.BlakeShelton.com/shows. ACM Awards co-host, CMA Awards' Entertainer of the Year and three-peat Male Vocalist of the Year, Blake Shelton, is one of the "most versatile of contemporary country singers" (The New York Times). With seven consecutive No. 1 singles (twelve overall), Blake's infectious multi-week No.1 hit, "Honey Bee" holds the record for the fastest-selling digital Platinum single for a male country solo artist. Another smash hit, "Sure Be Cool If You Did" off his 10th studio recording, Based On A True Story… due out March 26, 2013 on Warner Bros. Records, is starting 2013 off with a bang. Blake Shelton's passion for country music and his commitment to mentoring his teammates from The Voice make him an incredible ambassador for country music. Starting July 19 in Virginia Beach, VA, you can catch Blake live on his "Ten Times Crazier Tour." For more, please visit www.BlakeShelton.com and @BlakeShelton.